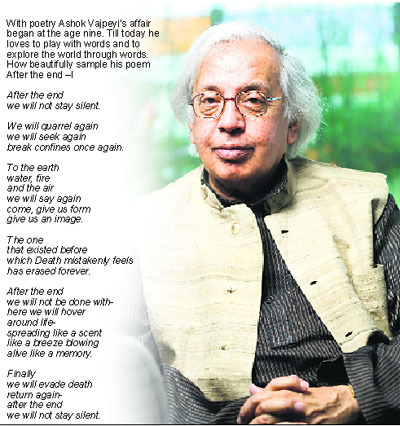 Just as a tiger won’t change its stripes, critic, poet and cultural activist Ashok Vajpeyi will remain quintessentially himself. Candid and not the one to mince words, he cares two hoots about rubbing people the wrong way. Be it dear friends Gulzar and Javed, who he calls "overrated poets" or the art academies in the country (some of which he has been at the helm), nothing escapes his censure. In a nation that propagates mediocrity, he is dogged in his pursuit for excellence. Whatever the circumstances, be it as part of the government or out of it, holding a position of eminence or having relinquished charge, his energies will remain devoted to the three areas he cherishes most. Being a poet of considerable mettle, expectedly, poetry is his first love. But then as he says, "this love gets channelled in other realms like classical and visual arts too." His term as the chairperson of Lalit Kala Akademi may have ended, but his association with visual arts has not. Associated with celebrated artist SH Raza’s foundation, he is busy working for several of its initiatives. These initiatives include a magazine Abstraction, of which he will be the chief editor. It will delve into abstract themes in different arts. Indeed, he knows abstraction is a much misunderstood, if not maligned, term in India. Says he, "We often forget that be it our philosophical thought, ritualistic imagery or tribal art, abstraction has been an inextricable part of our tradition." The educated middle class whom he calls "culturally illiterate," however, he feels is oblivious of this fact and considers it a western concept. This former Secretary of Culture, Union Ministry of Culture, has no hesitation in stating that bureaucracy is no different and is as much afflicted by cultural illiteracy as well as by inert incompetence. As a man who made Bharat Bhawan, Bhopal, a throbbing nucleus of art and culture, he quips, "My singular endeavour as a bureaucrat was to ensure that the state played a significant role in art but only by providing resources and opportunities and not by intervening ideologically." Unfortunately, he rues that when governments interfere (as happened in the case of Bharat Bhawan later on), the good work done is ruined. The state of art academies in the country, except for the working of Sangeet Natak Akademi, too pains him. As the chairperson of the Lalit Kala Akademi he tried to stem the rot by bringing in refreshing new programmes like Artists on Art and Others on Art lectures, organising Indian pavilion at Venice Biennale and much more. But he admits, "I was able to do only half the things I wanted to." Yet another regret he has is that while his role as a cultural crusader has never been challenged nor opposed, "no one cared to follow me." For the apathy towards arts, particularly absence of art criticism, he blames the media more so electronic which in its bid to cater to morons ends up creating more of the kind. A votary of private-public partnership in arts, the danger, he feels, lies in the fact that when private players come in, "the focus shifts to visibility and glamour." Not the one to grudge glamour, "who minds looking at cleavages? I have been obsessed with women all my life," he fathoms too well the place of eroticism and romanticism, more so in the arts. He laments the absence of shingaar ras in modern sensibilities and thought. His poetry, however, brims with the beauty of nature, of women and, of course, death, mortality, love and desire. "Take me as darkness takes the roots, as water takes the moon." Poetry for him is an organic process that can’t happen "unless you make love to the language," and he never plans a book on poetry. Prose, however, is a different matter. At the upcoming residency in France, he is planning to write a book on Ghalib and Kabeer. Author of nearly two dozen books, he wishes he had written more. Somewhere in the corner of the heart also lurks a desire to write a play in verse form. Not to forget the autobiography that is weighing on his mind, "Only I don’t know when to find the time to begin." In a life lived to the fullest dotted by numerous achievements and honours like Kabir Samman, the Sahitya Akademi Award the "to do list" is as long. As an executive trustee of Raza foundation he has a vision to redress many ills that plague the world of arts. But then for a man possessed with the idea of excellence…the standards for the self cannot be any less exacting.